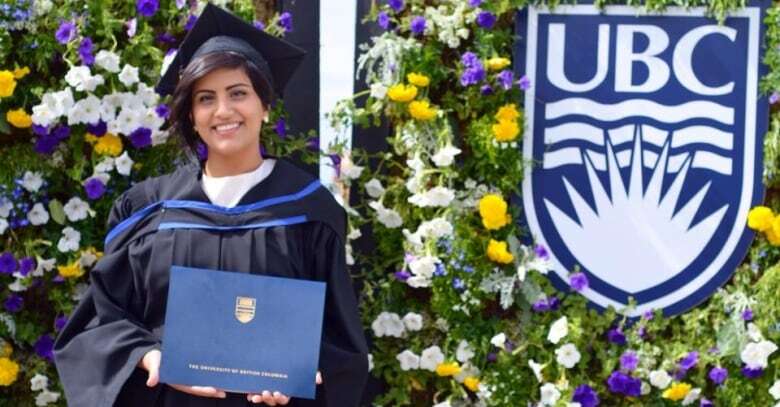 UBC graduate Loujain Al-Hathloul, known for her activism around women's right to drive, has been detained in Saudi Arabia since May 15. A graduate of the University of British Columbia is among 10 activists recently arrested in Saudi Arabia. Loujain Al-Hathloul attended UBC between 2009 and 2014, graduating with a degree in French. On May 15 she was arrested in Saudi Arabia along with nine other human rights activists, less than a month before the kingdom is set to lift the world's only ban on women driving. Three days later the state-run Saudi Arabia press agency issued a statement saying state security had arrested a number of people for forming a cell and trying to destabilize the country using foreign funding. Kareem Chehayeb, Saudi Arabia researcher with Amnesty International, called the actions a "chilling media campaign, where these activists were targeted as traitors or foreign agents," he said. "At this point in time there are no clear legal charges that have been presented. We still don't know where the activists are being held. We are obviously concerned about the conditions that they may be in." Three of the activists have been released. Al-Hathloul. who remains in custody, has not been allowed to contact her family or legal representation since she was detained. Al-Hathloul has been described as one of the most outspoken women's rights activists in the kingdom. In 2014, she was detained for more than 70 days after she attempted to live stream herself driving from neighbouring United Arab Emirates to Saudi Arabia. In September, the kingdom announced that the ban on women driving would be lifted by June 2018, sparking widespread celebrations. Sima Godfrey, an associate professor of French at UBC, said that when Al-Hathloul was her student she spoke openly about her plans to return to Saudi Arabia after graduation and fight for women's rights. "She is a very tough person. She knew what she was risking there and was not afraid. If anything, she was sort of looking forward to the challenge — she's not a shrinking violet by any means." Godfrey said that Al-Hathloul, who previously studied in Paris, came from a progressive family that encouraged her to become involved in politics. "She spoke a lot about her mother, who wanted her daughters to be out there and have their voices be heard," she said. "I'm extraordinarily proud of her. But of course I'm also quite concerned." Atiya Jaffar, who also attended UBC, said the pair became friends through various cultural clubs and activist efforts on campus. "She's really a force, that's something that I recognized from meeting her the very first time. She's incredibly fierce, incredibly well-spoken, and such an incredible advocate for women's rights," she said. "I remember connecting with her after she was detained last time, and she seemed of course to be shaken, but to not have lost the fire within her," she said. A year after her first detention, Al-Hathloul ran in the first Saudi elections open to women. In 2016 she was featured in Vanity Fair magazine alongside American actress Meghan Markle. Austin Jean, a spokesperson for Global Affairs, denounced the actions of the Saudi government in a statement. "Canada is extremely disappointed by the recent arrests of prominent Saudi women's rights activists and lawyers on charges of 'suspicious contacts with foreign entities and offering financial support to enemies overseas,'" it read in part. "These arrests are inconsistent with the Saudi government's stated commitment to create a more tolerant and open society." Chehayeb also said the arrests do not line up with Crown Prince Mohammed bin Salman's promise to reform the kingdom. "There's been a massive PR effort to presenting himself as a reformer, but how can we talk about social reform and transforming this society when human rights activists that in many cases have pushed for this reform, are being thrown in jail?" he said. Chehayeb said there is concern that Al-Hathloul and the other activists will be charged with "trumped-up security charges" under Saudi Arabia's counterterrorism law. A spokesperson for UBC declined to comment on the case, saying the university has over 300,000 alumni and that it would be "inappropriate" to comment on actions unrelated to their time at UBC. But Godfrey said Al-Hathloul was one of those rare students whose time at UBC marked her life. "Here's someone who has gone out at great risk to herself and is determined to change the lives of women and change laws," she said. "She's one of those students that I will remember, always." Michelle Ghoussoub is a journalist with CBC News in Vancouver. She has previously reported in Lebanon and Chile. Reach her at michelle.ghoussoub@cbc.ca or on Twitter @MichelleGhsoub.